Writing about a trip is always so difficult for me because it's almost impossible to truly capture the experience in words. For me, travel has more to do with a feeling than it does anything else. When I travel anywhere, even if it's just a few miles down the road outside of my hometown, I feel a sense of freedom and curiosity. Let's face it - daily life can be monotonous. Travel is the cure. My husband and I bought a new car over the Summer, and we immediately knew that we wanted to take it out and put it to good use. As I said before, we didn't necessarily have a plan. We knew San Francisco was the ultimate destination, but we weren't sure about what the journey would really look like. So we hopped in our car and drove. This was my first real "road trip". 1. Our first stop was in Los Angeles. Although we've both been there many times (I was born there), we had never been to Canter's deli and wanted to stop and get some grub on our way out of the city. We split a reuben sandwich that can only be described as worth the exorbitant amount of calories. I am still recovering from all of the rich food we indulged in on this trip! Again, worth it though. 2. After leaving L.A., we took the 5 freeway and ended up at Pyramid Lake. The visitor's center offers information on California's water supply. This was a completely random little pit-stop, but my husband and I are always drawn to water and we had to take a look at the gorgeous views. 3. We've had family members rave about their trips to Paso Robles. My brother-in-law brews his own beer, and everyone in our family loves their wine. Living near Temecula wine country, we felt it was our duty to stop and "test" the wines in Paso Robles. 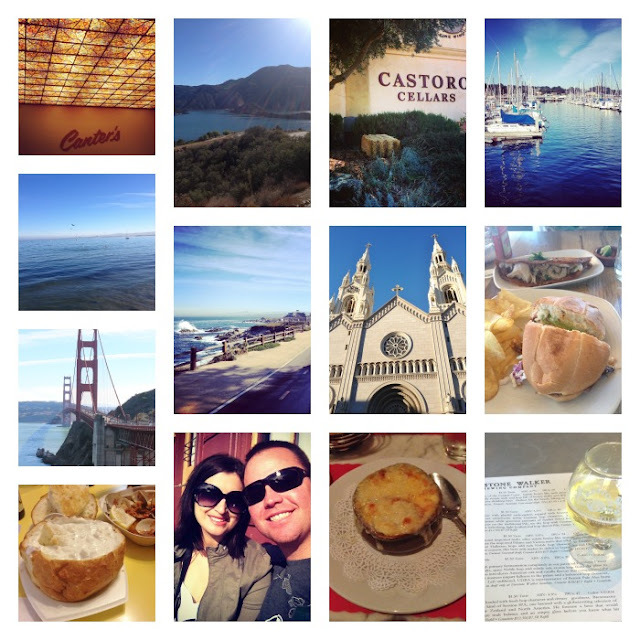 We wound up at Castoro Cellars, and had an amazing experience. The service was perfect, and so were the wines. We received the whole treatment on how to properly taste each variation, from dry whites to full-bodied reds. The verdict? Definitely better than Temecula. Firestone Brewery (pictured last) was so good, that we stopped again on our way home from S.F! 4,5,6. Monterey was probably my favorite stop on the trip. It's such a quaint little sea-side town with so much history and character. I wish we could have stayed longer. Overall, I loved being on the road. For once I didn't care to pull out my phone too often or check messages. My husband and I talked, sang our favorite tunes, and just kept on driving. California is a wonderfully diverse state, and I'm happy to call it home. I loved reading your trip recap! It all just sounds so fun and relaxing. And the food sounds amazing! Plus, it's all within my own reach so I love getting ideas for one of my own adventures at some point! Thanks Gina :) I give it up to those who write travel blogs because it's so hard in my opinion! I hope you can make it up north sometime, I know you'd love it. People watching was fun. Haha, I shouldn't allow them! This girl needs to get back into shape! It's been downhill since the wedding, which is so cliche right?! Oh fun! I live in Temecula, which is the last city in Riverside county before you hit San Diego county. It's such a pretty drive. Monterey is just gorgeous! You're lucky you get to go there more often. Wow - two of my favorite things - roadtrips & being a tourist in your own backyard :-) I agree - there's something about trips - you don't have to go far - but just being in the mindset that you're on holiday is so amazing. Glad you had a great time - that Reuben sandwich sounds amazing - yum!